Farm subsidy support and access to export markets lie at the heart of farmers’ minds when deciding how to vote in the upcoming Brexit referendum. 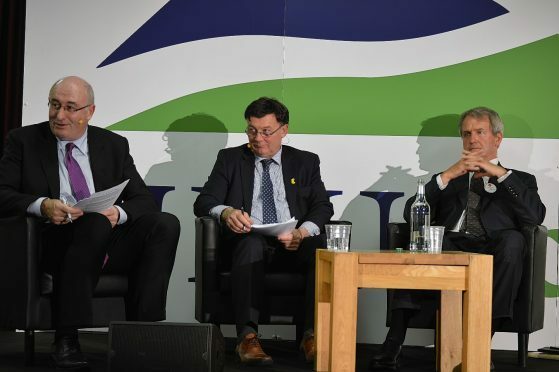 That was clear from listening to questions from the audience at NFU Scotland’s in or out of Europe debate in Edinburgh on Thursday, when two political heavyweights argued the cases for Britain staying in Europe or going it alone. Representing the remain camp was European agriculture commissioner Phil Hogan. Big Phil, as he is sometimes known, focused on facts and figures telling farmers he could guarantee four more years of financial support under the current Common Agricultural Policy (Cap) and reminding them that on average £6.50 out of every £10 entering Scots farmers pockets comes from the Cap. “It would be wrong for me to suggest that the Cap is perfect, it is not. But it provides an income safety net for Scottish farmers,” said Mr Hogan. Mr Hogan pledged to continue with his quest to simplify the Cap and said changes announced earlier this year would result in less fines for farmers and a change in attitudes where officials would be there to help farmers, rather than catch them out. His counterpart Owen Paterson – MP for North Shropshire and former Defra Secretary of State – painted a picture of an agricultural subsidy scheme outside of Europe. The scheme, claimed Mr Paterson, would be decided upon by MSPs in Scotland and it could be better shaped to suit the country’s landscape and environment. Agricultural policy outside of Europe, claimed Mr Paterson, would be free from “impossible” policies such as the three-crop rule. On the issue of trade, Commissioner Hogan argued that leaving the EU could result in the UK losing direct access to 500million consumers across Europe plus the benefits of more than 53 global free trade agreements. Mr Paterson said the UK would maintain trading links if it left Europe, arguing that the country could develop new agreements with countries such as the USA and India. Audience members seemed to be of mixed opinion about which way to vote, and the debate was at an even keel until Mr Paterson said “I have now forgotten what the detail was” when a farmer accused him of leading Defra when it “stole £200million from Scots farmers”. The farmer was referring to the issue of convergence uplift – extra Cap monies totalling around 230million euros which were allocated to the UK from the EU to bring Scotland’s per hectare subsidy support figure more in line with the European average. This is still a sore point for Scots farmers and Mr Paterson’s comments won’t have helped his cause. That said, both politicians gave sound and compelling arguments for both of their causes, providing plenty food for thought. When it comes to the vote on June 23, farmers and crofters need to ask themselves – do we stick with the current regime, warts and all? And is it a case of better the devil you know? Or do you take the plunge into the unknown, with the hope of creating a new policy better suited to Scotland’s needs? Either way, this vote has the potential to create far-reaching changes to the Scottish agricultural community. Use your vote, and if like me you plan to attend this year’s Royal Highland Show, get a postal vote and don’t miss out as June 23 is the first day of the show.